As a workshop leader for many of Decibels’ innovative projects in the past, I was more than happy to take on the mantle for this project – the theme is “Creating Music through technology”, sponsored by the Sobell Foundation. My first stop was at Stoke Mandeville Combined School in Aylesbury where they have a Teacher of the Deaf and a resource base for deaf/hard of hearing children. I introduced the base to the world of the brilliant Makey-Makey kits. For them, I felt that this would be a great hands-on and tactile introduction to sound and technology, as well as allowing scope for their own creative ideas. 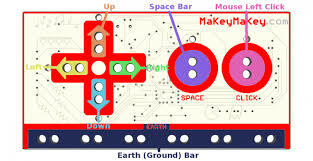 If you haven’t heard of Makey Makey, it basically turns everyday objects into touchpads with sound output by attaching the kit to said objects and to the computer in turn and then utilizing many apps and games on the internet. As the participants sat around the table, I showed them the pretty printed ‘Makey Makey’ circuit boards which I then connected up to a computer via a USB cable. 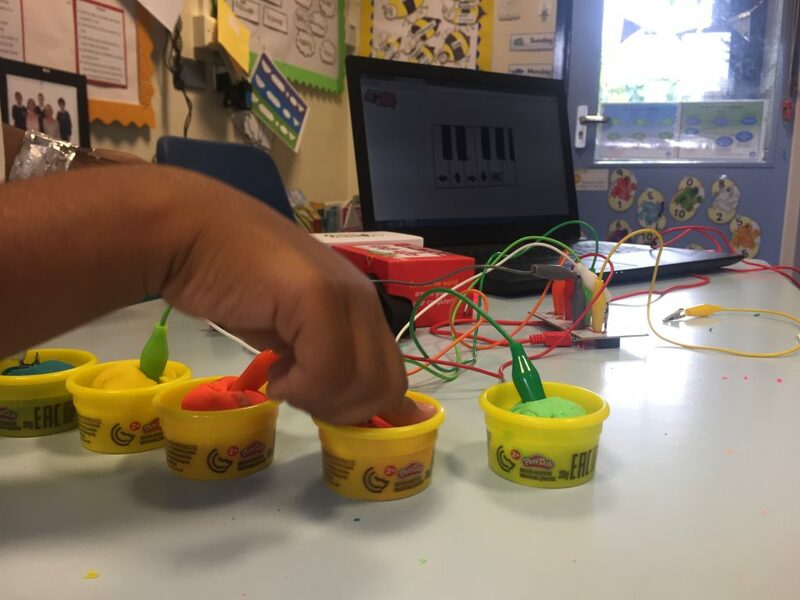 Then supplementary wires with crocodile clips on the terminals would run from the Makey Makey to conductive objects such as playdough, bananas, aluminium foil, coins and such. As I set up and demonstrated the use of the kits, the group could quickly see that makey-makey just takes over the functionality of the space bar and other computer keys in a FUN and exciting way. The conductive objects become the computer’s new keys, like a joystick or music keyboard! It was important to learn about building a circuit which starts with attaching the ‘earth’ wire to our bodies. We made a foil wrist band and used a crocodile clip to bite onto the foil touching our skin. This meant that we were hands free to touch and play, as well as unleash our imaginations. The fun part was exploring which conductive objects can conduct electricity and non-conductive objects known as insulators (e.g. plastic, dry tissues, cardboard). All stuff around us is made of atoms and inside these atoms are the amazing bits of stuff that can carry electricity. They are called electrons. In some materials, like plastic, these electrons are tied closely to the atom and don’t want to move. Objects made of this kind of atom can’t conduct electricity. In most metals though, the atoms have looser electrons that can move more easily and this means they can carry electricity. All in all, it was a very good afternoon and I look forward to visiting the school again for the next stage of music technology where we explore haptic technology. Haptic technology are body worn devices that can transmit sound by means of vibrations – what are they going to make of it? Till next time. Related links: http://www.decibels.org.uk/ click to read up about Decibel’s Charity and the work that they do. More music technology programmes are being rolled out for Autumn/Winter 2018 contact Decibels to register your interest.